Elliot is an energetic and enthusiastic girl, aged 15. In her middle school, Elliot is famous for her vitality amongst her peers. She is vigorous and into sports. Unlike other girls, most of whom go for Babes Dolls, Elliot like playing with boys. She swoons over the skateboard and she usually paly with skateboard together with other boys. In addition, her skills are quite excellent. Of late, she has been saving money for his long-expected FOSJOAS electric skateboard K1 that was released by Moben Global Inc. months ago. Although Moben Global Inc. is a leading scooter-maker, Elliot is attentive to its released electric skateboard K1. 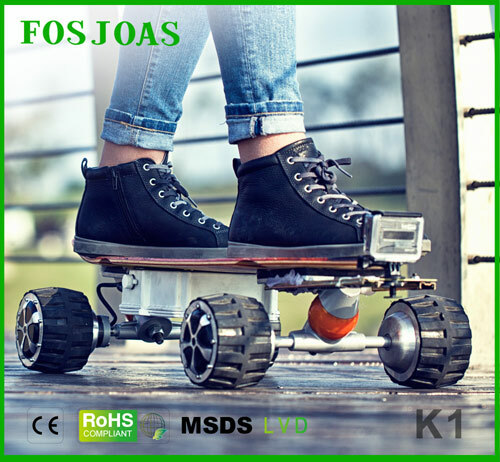 According to the promotion on the part of FOSJOAS, K1 is an electricity-powered skateboard. In terms of exterior design, it stays traditional, whereas in terms of the breakthrough and innovation in technology, it is bold in the sector. For now, Elliot has saved sufficient money for it. Elliot received her ordered electric scooter K1 the day before yesterday. She impatiently took it out of her house on that day and had a go at K1. On the account of years' experience of skateboarding, she successfully learned to steer FOSJOAS K1 in no time. She was able to keep herself balanced and make many amazing showings. In addition, the rider of FOSJOAS K1 will not be tired at all even if he plays with the K1 for hours on end. FOSJOAS K1 is one skateboard that is powered by electricity. The potent battery group made by Sony offers a powerful thrust, making a great contribution to the high speed. Elliot still can experience the same feeling of high speed as the traditional skateboard. Apart from the advanced technology, FOSJOAS K1 self-balancing unicycle is more stylish for FOSJOAS offers stickers of various themes available to the K1 riders. Elliot picked several dashing and characteristic stickers so that she could change the stickers on the board of K1 at will, getting rid of the featureless looks of her skateboard. These gorgeous stickers are a massive temptation for skateboard-lovers like Elliot.